Yep. That sound. Now, if you happen to like the vuvuzela, if you’re feeling the South African Gees (spirit), maybe you can follow these instructions to make the horns even louder. Photo (CC-BY-SA) Axel Bührmann. 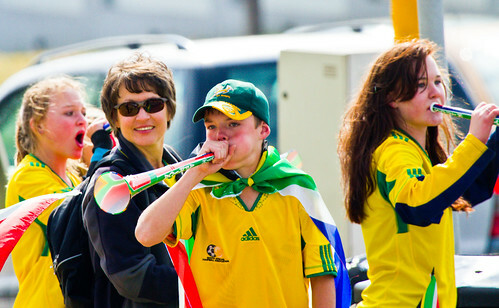 Are you a World Cup fan annoyed by the constant sound of the South African vuvuzela horn? Wish you could remove that sound from your World Cup viewing experience? Do you want to learn a little bit about powerful modular effects routing can be on Linux? Either? Both? Call it “football”? “Soccer”? Any way round, we’ve got you covered. Felix Kaechele, a German-based Fedora community member and Fedora Ambassador, uses JACK to filter out sound from his live World Cup feed. If you’re curious about how JACK works and how to add effects to your system (or record a system audio feed, etc. ), this is the way to go. 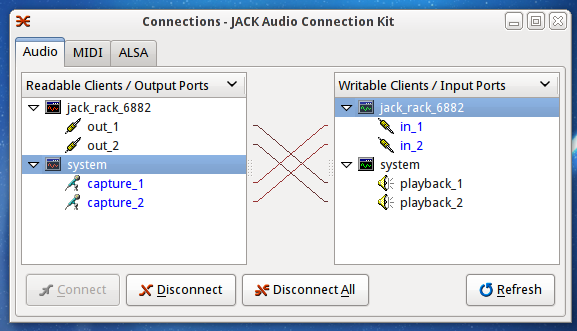 The trick here is that PulseAudio, the default sound API on Linux, actually gets routed right into JACK. JACK lets you patch software together for adding effects. Via Felix’ tutorial, the simple routing from the system right into a rack of effects. After applying these changes, please re-login in order for them to take effect. These steps tweak real-time performance for better JACK sound results. But in this event, you’d actually install the Pulse module and route Pulse into JACK, as in the instructions. Setting up Ubuntu is a topic for another article, but there’s a preview. But the musical applications here should be clear: JACK makes it easy to set up a modular rig. Want to add effects to a Pd patch? Record audio from a system application for sampling? Route together some effects to make a virtual stompbox rig for your guitar? Having JACK is a bit like having an extensive patch bay for software. Via OSTATIC; thanks, Brad Linder! Brains, Computers, Focus: How Do You Stay Productively Creative?